On a blazing hot morning in Luang Prabang, fraught with emotional quarrels between sleepless travellers, four worn-out companions clamber into a tuk-tuk and make their way to the famed Kuang-Si Waterfalls. Tensions are high, but almost as soon as we hit the open road, our jitters are replaced by the reassuring thrill of adventure. Hip-hop beats pulse over the tuk-tuk’s roaring engine, a warm breeze caresses our skin, and all is mostly forgotten. At the entry gates, Amy and Egal dawdle to buy sugarcane from a market stall. Tom tuts in impatient frustration, cussing loudly in his South London husk - the Lao woman at the ticket desk looks up in alarm. "He's crazy," I tell her. "Bo panang." Tom beats his chest like a gorilla. The woman laughs and hands us two tickets. The trail unexpectedly leads us through a bear sanctuary, where cute fluffy bears bask lazily in the sunshine. When we finally hear the sound of running water, my heart skitters in excitement. The Kuang-Si Falls are what desktop backgrounds are made of. Twinkling waterfalls tumble onto sunlight-dappled pools of turquoise; a ring of verdant, leafy jungle caresses each lagoon. We venture onwards through chattering throngs of swimwear-clad tourists and locals. Tom disappears on a quest to discover the mysterious "secret spot"; Egal tears off his shirt and crashes into the nearest pool. He returns shivering, cursing in his North Carolina drawl: "That water is goddamn freezin'." So we follow Tom, veering away from the tourist trail, flip-flops slapping over soil, rocks, roots. Once we pick our way through fallen trees, slide past broken barbed-wire fences, and ignore a handful of No Entry signs, we emerge into a private paradise. High in the blinding sky, thundering water cascades from mossy green rocks and erupts like liquid silk into a turquoise lagoon. Unreal. Amy and I peer over the edge of the waterfall, back down to the bottom of the cliff, where people move like ants around translucent blue lagoons. These waterfalls are something else. We while away the time splashing, soaking, in awe. Amy and I laze peacefully in the humidity, working on a logic puzzle, brought all the way to a Lao waterfall from Heathrow's WHSmith. The guys compete like kids, doing push-ups on rocks, climbing onto vines, leaping into the lagoon, again and again. 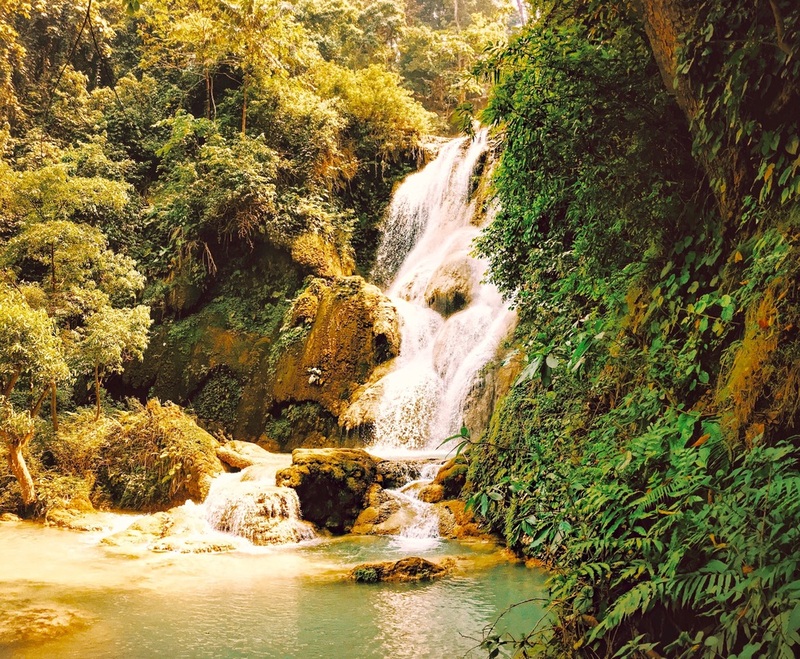 At the Kuang-Si Falls, our difficult morning trickles quietly into a blissful afternoon. 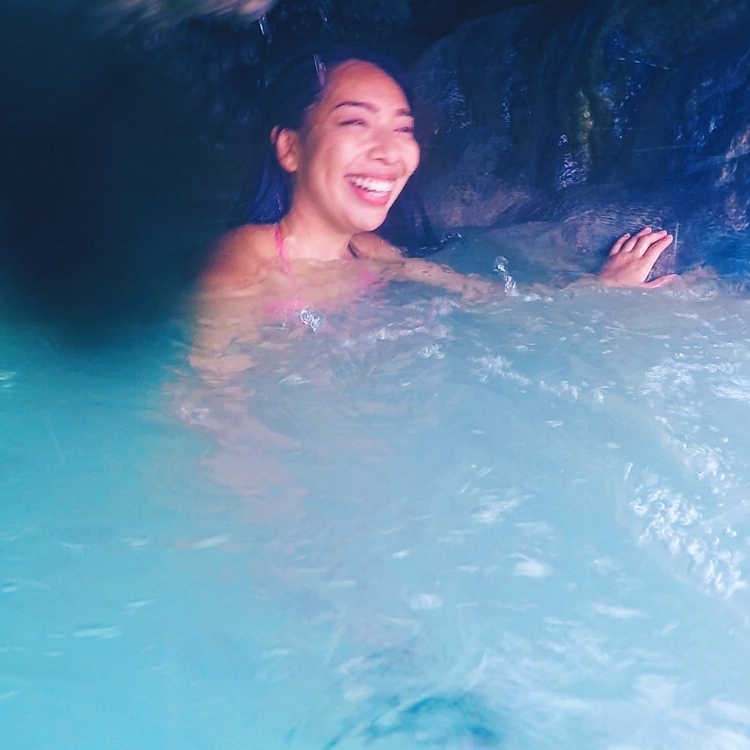 The bliss is made greater when we chance upon a secret cave concealed behind the roaring cascade. In the little cave, smooth limestone hovers above green water; wet kisses linger, forever hidden, as soft moss caresses our toes. When we leave, Tom reminds us to stay low, just in case. We say goodbye to the lagoon, to the No Entry sign. We slide back past the barbed-wire fence, pick our way back down the fallen trees. I feel a little sad when we leave; the lagoon is already a memory. Before long, we’re bouncing in the back of a battered metal tuk-tuk, blue paint peeling from the ceiling, bare feet hanging over the edges. Amy is in her element, singing along to the music with her eyes full of stars, voice mingling with the wind. Dusty roads get left behind as we curve further and further from the waterfall. Fading gold light flickers through the spaces between banana leaves. Content and comfortable, I close my eyes and breathe. Warm fingers are laced reassuringly between mine, and I think, I'm OK. Yes. I have everything I need.